In the recently released USQ Strategic Plan, there is a statement to “Develop a plan to create separate college and community competitive divisions.” It came as a pleasant surprise to some, including myself, and here is why. Entering World Cup 8, there was a widespread belief that if Lone Star Quidditch Club won, this split would occur—the split would need to occur. As it happened, Lone Star fell on the wrong side of a snitch grab and the idea was erased from the minds of the quidditch community. Though fantasy tournaments and the inaugural MLQ season have commandeered the focus of the community, I would like to take a moment to draw attention back to the importance of this topic. A negative side effect of the current system is the dilution of intercollegiate competition. In the case of teams that are considered a university club sport, or teams that are looking to achieve school sponsorship, inter-collegiate competition is important. Some club sport programs require that roughly 80 percent of a college team’s competition be against other collegiate teams. Of the nine games University of Texas played at World Cup 8, seven were against community teams. On what is arguably the biggest stage in the sport, this collegiate team’s competition was over 60 percent community teams. This information in the hands of a club sport council deciding on whether their school’s team should be recognized by the university could have a negative impact on an application. This, in turn, can inhibit the recognition and achievement status some college teams would attain with the support of their university, resulting in a largely missed opportunity to feed the sport’s growth. Let’s briefly address something that was on the lips of many last season: the transfer of players from collegiate teams to community teams. While I do agree that it is a better option to transfer and continue playing rather than to quit altogether, I do find the rate at which undergraduates have left their teams for community teams to be alarming. If the “out” that is the transfer to a community team from a college team is removed, or at the very least remove the appeal of it, more players will find a way to resolve conflict that arises. Perhaps in the future we will see more players wanting to represent their university while they can, rather than competing with and against community teams as an undergraduate. Unfortunately, there is no clear-cut, cure-all remedy for this concern at the moment and the discussion of transfers could be an entire article in and of itself. The aforementioned issues caused by the season-long, inclusive competition are currently harming college programs. These issues can lead to stunted growth rates of collegiate teams and lack of school recognition, in turn keeping the sport from reaching its true potential. If community teams are going to evolve into semi-professional teams, they will need a pool of players to draw from in order to thrive. As we’ve seen with existing community teams, each year players cycle out of the system and their spots are filled by graduated collegiate players. With the current model, there is a danger of phasing collegiate teams out of the system. As a consequence, the upkeep of community team roster reloading is removed and could lead the sport to a struggling decline. A divisional split will have an immediate positive impact at the level that determines the life or death of competitive quidditch: college teams. A division among the classification of teams bolsters collegiate programs by creating greater, more-defined intercollegiate competition. This is a large matter of appeal for college students looking to join a club. As a student discovers they have an opportunity to play against other schools while representing their own school, it can be thrilling. The moment it is revealed to new recruits that they also compete against players who have graduated, been playing for years and come together to essentially create “all-star” teams, it can turn people off or, worse, away from the sport entirely. The upcoming changes bring resolve to this issue. In addition, as community teams grow and look to recruit, they will create appeal for their programs to college players so that when they graduate, they will join said community team. Without direct competition and through fostering positive relationships with local college teams, these mutually beneficial partnerships are formed where veterans of the game can coach willing college programs and help bring them to higher level strategy and refined skill. 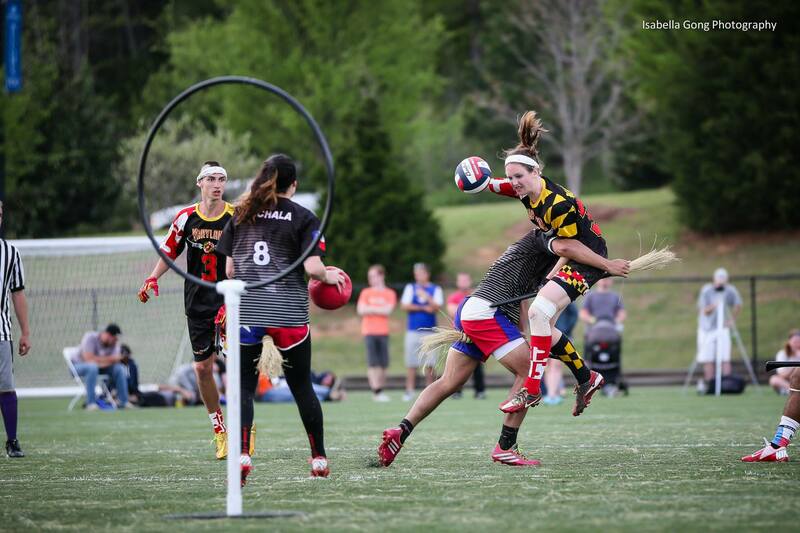 A divisional split amongst collegiate and community teams will pave way to a new era of quidditch. With the recent shifts of leadership in USQ and the birth of a USQ National Cup, 2016 is an extremely feasible time for this to take place. A viable form for this change to take is as follows. For the inaugural year, teams that identify as “college” or “community” still compete against each other throughout the year, as they have in the past, up until their regional competition. Using a similar bid distribution to what would already be used, teams still qualify through their regional to compete at the National Championship. At the National Championship, teams compete in their respective division: collegiate or community. Both a collegiate and a community champion will be crowned. In future years, as more community teams develop across the nation and more collegiate teams are recognized by their schools, seasonal play within a team’s respective division will emerge at that time. In following years, community teams can begin exclusive competition amongst themselves throughout the season in the form of a three-game series, similar to that of MLQ. These series could co-occur with collegiate tournaments where an interested group of spectators are already present. The previously mentioned points of concern are largely addressed with the proposed model of separate, competing divisions and the perks of possible coaching opportunities and retention of players are tacked on. The immediate benefits for college programs and future recruitment opportunities for professional programs down the line are loud knocks on the door of opportunity.